Let’s get this out of the way first: Nobody, it seems, likes to “do” dog nails. Not you, not the dog, nor anyone else who may be called upon to take on nail-clipping for you (such as a technician at your local veterinary hospital or even a professional groomer). But for the health of your dog, it must be done, and should be done frequently enough to keep your dog’s nails short. This isn’t an article about how to make nail cutting a more pleasant experience for you and your dog; this magazine has run plenty of those (see list at right). Don’t be tempted to skip that step: You should read up on positive reinforcement and desensitization techniques before you even think about snipping; of course your dog should be comfortable with having his feet touched and manipulated before you attempt any type of nail trimming. If he is not – and especially if he shows signs of serious distress or aggression – consult a qualified dog behavior specialist to help you modify this behavior. Better safe than sorry. No, this article is what you’ll need to know before you have appropriately and positively introduced your dog to the nail-cutting experience. I hope to convince you to commit to a regular nail-maintenance program for your dog. When dogs spend a good deal of time outdoors, running on various hard surfaces, including concrete and blacktop, their nails are gradually worn down, and they have less of a need for formal nail-grooming sessions. But today, with many suburban and urban dogs increasingly confined indoors when their owners are at work, and running mostly on soft surfaces such as lawns when they are outdoors, this welcome friction is often absent in their daily lives. Long, unkempt nails not only look unattractive, but over time they can do serious damage to your dog (not to mention your floors). 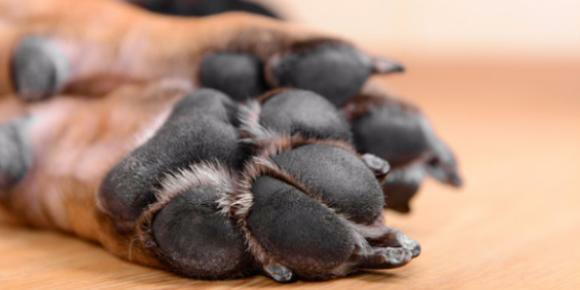 When nails are so long that they constantly touch the ground, they exert force back into the nail bed, creating pain for the dog (imagine wearing a too-tight shoe) and pressure on the toe joint. Long term, this can actually realign the joints of the foreleg and make the foot looked flattened and splayed. Again, this isn’t just an aesthetic problem, it’s a functional one: Compromising your dog’s weight distribution and natural alignment can leave her more susceptible to injuries, and make walking and running difficult and painful. This is especially important in older dogs, whose posture can be dramatically improved by cutting back neglected nails. In extreme cases, overgrown nails can curve and grow into the pad of the foot. But even if they are not that out of control, long nails can get torn or split, which is very painful and, depending on severity, may need to be treated by a veterinarian. And in the end, unattended nails create a vicious cycle: Because the extra-long nails make any contact with his paws painful for the dog, he avoids having them touched, which leads to unpleasant nail-cutting sessions, which makes both human and dog avoid them, which leads to longer intervals between trims, which leads to more pain. So what’s the goal? What’s the “right” length? While some breeds (most notably the Doberman Pinscher) are often shown with nails so short they can barely be seen, the most commonly accepted rule of thumb is that when a dog is standing, the nails should not make contact with the ground. If you can hear your dog coming, her nails are too long. Dog’s nails differ from ours in that they consist of two layers. Like us, they have the unguis, a hard, outer covering in which the keratin fibers run perpendicular to the direction in which the nail grows. But unlike us, under their unguis, dogs have the subunguis, which is softer and flaky, with a grain that is parallel to the direction of growth. The faster growth of the unguis is what gives the dog’s nail its characteristic curl. Proponents of dewclaws argue that dewclaws are not vestigial, but indeed used to grip objects such as bones, and to provide important traction when a galloping dog needs to change direction. (Poke around Youtube and you can find videos of Sighthound lure coursing; they actually lay their entire forearms perpendicular to the ground when redirecting their momentum.) Even the floppy double-dewclaws of breeds like the Great Pyrenees are said to have some purpose (traction or a “snowshoe” effect in the snow). One thing is certain: If a dog has dewclaws, they need to be trimmed – perhaps even more often than nails that routinely touch the ground. Because the dewclaws rarely touch the ground and so aren’t worn down, they tend to be pointier than the other nails. But perhaps because dewclaws are so loosely attached to the forelimb, many dogs object to trimming them much less. Shortening the nail without “quicking” the dog is easier said than done – unless your dog has white or light-colored nails, in which case, you’re in luck: The quick will be visible from the side, as a sort of pink-colored shadow within the nail. Avoid going near it. If you trim the nail with a clipper or scissors, trim a bit off the end of the nail, and notice the color at the end of the nail (in cross section). As soon as the center of the nail starts to appear pink, stop. You can’t see the quick in a black or dark-colored nail. With these nails, you have to be even more conservative about how much nail you trim off. After making each cut, look at the cross-section of the nail. If you see a black spot in the center – sort of like the center of a marrow bone – stop cutting. It’s likely your next slice will hit the quick. The longer a dog’s nails are allowed to grow, the longer the quick will become, to the point that taking even a very small bit of nail off the end “quicks” the dog. Then the goal becomes a matter of snipping or grinding the nails to get as close as possible to the quick, without actually cutting it. This is perhaps easiest to accomplish with a grinding tool (such as a Dremel), though it can be done with clippers, too, with practice. By grinding away the nail all around the quick – above it, below it, and on both sides – the quick has no support or protection, and within days it will begin to visibly recede, drawing back toward the toe. If a dog’s feet have been neglected for months (or, horrors, years) at a time, it might take months to shorten those nails to a healthy, pain-free length. But if you keep at this regularly, it should get easier for the dog to exercise. And the more he moves, the more his nails will come into contact with the ground in a way that will help wear the nails down and help the quicks to recede. Nail clippers use blades to remove the tip of the nail. There are a couple of different styles to choose from, but no matter what type is used, their effectiveness is dependent on the blades being sharp and clean. Guillotine trimmers have a hole at the end, through which the dog’s nail is inserted; then, as the handles of the tool are squeezed together, an internal blade lops off the end of the nail in a fashion reminiscent of the execution device for which the trimmer is named. Some people find it easier to chop through thick nails with these clippers, but others find it difficult to thread each nail through the hole at precisely the right distance from the end of the nail, especially when the dog is wiggling or uncooperative. On the plus side, though, it’s fast and easy to replace the blade in guillotine-style clippers – in fact, most guillotine clippers are sold with replacement blades, which encourages an owner to swap out the blade as soon as the tool loses any effectiveness. Scissor- and plier-style trimmers are arguably easier to use, but need to be sharpened from time to time – and who knows how to do this, or where this service can be obtained these days? Many people find themselves discarding and replacing these tools as needed, instead. Grinders are relatively new to the world of canine manicures. So many owners discovered how easy it was to use that old hardware standby, the Dremel tool, that you’ll sometimes hear that brand name used as a verb, as in “I Dremel my dog’s nails.” Soon enough, pet-specific rotary grinders found their way to market – and now Dremel makes a pet-specific grinder, too. Regardless of the type of grinder you buy, make sure it is appropriate for your dog. Some cordless models might be perfectly adequate for a Papillon, but simply may not have enough oomph for trimming the thick, hard nails of a larger breed like a German Shepherd. Though Dremels and other grinders come with several different attachments, most owners opt for the sandpaper barrel. Change the sandpaper sleeve whenever you see it’s becoming worn. Be sure to acclimate your dog to the sound of the grinder, and then slowly introduce the tool, so that your dog is accustomed to the grinding sensation on his nails. Don’t keep the rotary tool stationery on one area of the nail, as the heat it generates can be painful for the dog. Be aware of dangling hair – both yours and your dog’s – and take care not to have it get entwined in the tool’s spinning drum. To protect your eyes, wear safety glasses. And because nail grinders can generate a good deal of nail dust, a disposable surgical face mask is a sensible idea as well. If this sounds like a lot of work, it is – at least initially, until you and your dog develop a nail-maintenance routine. And “maintenance” really is the name of the game; it’s far easier for you (and less painful for your dog) to maintain his short nails than to shorten nails that have gotten long, with the inevitable corresponding long quicks. If your dog’s nails have gotten too long, or you adopted a dog whose nails were too long, you need to really commit to frequent trimming to restore his foot health and comfort. Three to four days is probably the minimum amount of time that’s advisable between salon treatments that are intended to encourage the quicks to recede. Once a week is ideal if you want to gradually shorten your dog’s nails and eliminate all that clickety-clacking on your wood floors. And, depending on the rate at which your dog’s nails grow (and what sort of surface he exercises on) once or twice a month is a reasonable goal to maintain the nails at a healthy length. No matter what frequency you choose, make a commitment. Earmark a specific day of the week or month for your grooming sessions, and stick with it. You’ll have a better chance of remembering to do your dog’s nails on a regular basis if you get into a routine. It may also be helpful to dedicate a location in your home for doing your dog’s nails – somewhere comfortable for you and your dog and with a good light source. Make sure you have everything you need at hand before you begin: clippers, styptic powder and some tissue or a small clean towel or washcloth (in case you accidentally quick the dog), eyeglasses for you (if you need them to see well up close), and lots of small, high-value treats to keep the experience rewarding for your dog. It’s also smart to have a leash on your dog, even if he’s usually fine with having his nails clipped; many dogs will attempt to leave abruptly if they are “quicked.” And who could blame them? If you do make a mistake, don’t make a huge fuss. Feed your dog some treats, and proceed with more conservative clips. Thank you to The Whole Dog Journal for the informative article. A regular contributor to WDJ, Denise Flaim raises Rhodesian Ridgebacks in Long Island, New York.